Hoy knows what it is doing when it comes to making exciting rides for children. With the Bonaly, they have expressed immense attention to details such as weight, transmission, safety and ride quality. Aside from a few minor glitches, we cannot see anything wrong with it. The Hoy Bonaly is basically a scaled down version of Hoy’s reputed mountain bike range for child riders. As usual with Hoy, the name comes from a significant place in the life of the founder. The Bonaly is named after the place near the hills of the Petlands where he discovered the pleasures of off road biking – a fitting origin story to the name of this model since it too seeks to start off young riders on a love for adventure. When it came to construction, Hoy wanted to keep the weight as light as possible to allow for a variety of body types to ride the Bonaly fluently without much stress. The frame is 6061 HOY aluminum as is the fork and steerer. The frame has been made to sit as low as possible improve handling and balance. Shifting is done via a Shimano M310, 8-speed system which is smooth and well suited to a variety of conditions as you would expect from Shimano. The Bonaly features a cool Tektro V-brake system which is essentially borrowed from the race range. The tires are Kenda K1047s that generate enormous traction and grip on loose surfaces. The entire bike weighs just 9 kilograms. Hoy has taken great measures to deliver lightweight, stiff construction, a comfortable ride and a racing attitude all in one package so it offers good value for money. Apart from some minor technicalities and isolated incidents, most customers do not at all regret that they bought the Bonaly. 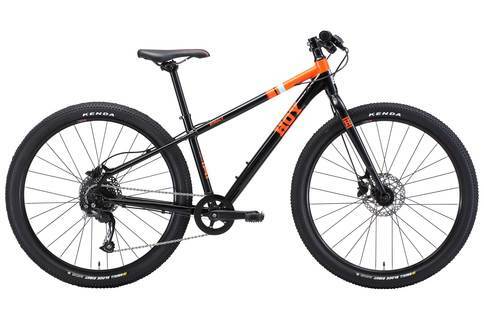 The Hoy Bonaly is great value for money as it delivers on a very high standard of mountain biking and adventure riding for pre-teen children.